Si es un amante de la cocina española pase tiempo en Cartagena disfrutando de un festín de exquisiteces locales en una excursión centrada en las tapas. En un grupo pequeño con otros apasionados de la gastronomía, visitará cuatro restaurantes recomendados por su guía y probará especialidades menos conocidas que no suelen estar en los menús turísticos. Ir caminando de un sitio a otro le permitirá ver más de la ciudad de lo que haría en un autobús y todas las bebidas y degustaciones están incluidas para una experiencia sin interrupciones. Ana was such a wonderful tour guide and the food/beverages were amazing! I highly recommend this Tapas Tour, you won’t regret it. The tour was great, HOWEVER, I had to leave our group and race back to the ship as the time to end the tour was late. I had to ask the ship's personel to wait another 15 minute to give all of our group a chance to get back. The guide did not return with them, and had I not rushed ahead the ship would have pulled up the gang plank and closed the entry! Very poor on the part to the guide. My sister and I loved this walking tour. Daniel was just great - friendly, knowledgeable, and fun. 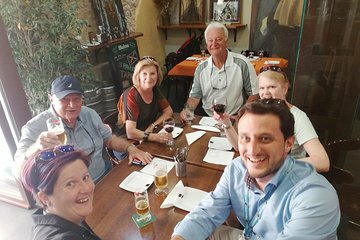 We got to sample lots of different tapas and drinks while learning about Cartagena in the charming old part of town. It was advertised as two hours but we took our time and enjoyed his company for three. I highly recommend this intimate, informative, and delicious tour.